Spring fever, spring cleaning, spring green. Spring brings renewal, a time to revive healthy habits, a time for new life. One of the changes around my home since last spring is my husband’s decision to give up meat, eggs, and dairy. As a result, the whole family has gone mostly plant-based (plus some seafood) and I’ve gotten more creative in the kitchen. When one decides to give up all animal products (which I haven’t), there are considerations to be made that may not immediately come to mind. Depending on your motivation, health vs. moral convictions, you have to make choices that reach beyond the plate. One of those decisions is what is in your glass. Wine is made with grapes, which are obviously vegan, but some refining agents are not. Some products use gelatin made from fish, a milk protein called caseins, or egg whites. While ingredients are not listed on wine bottles, some will clearly state whether or not the product is vegan friendly. Two Gonzalez Byass wines I recently sampled state as much on the tech sheets. 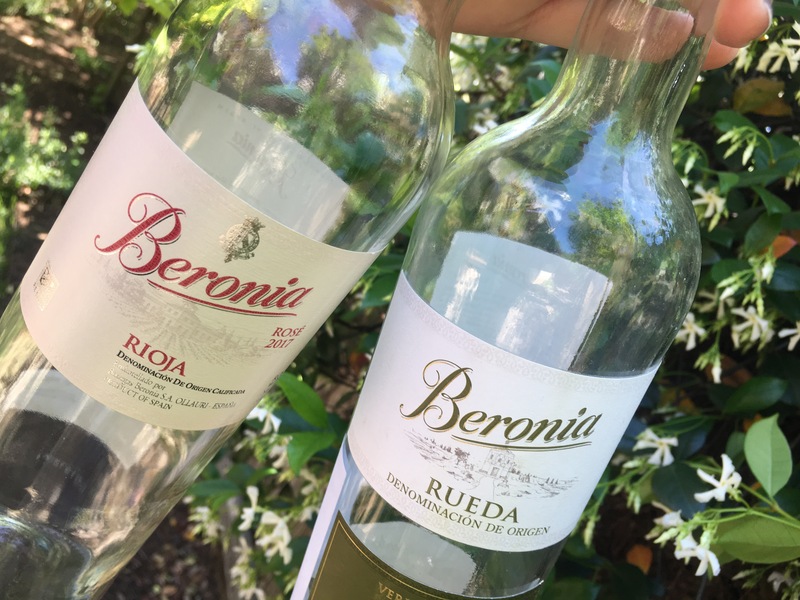 Accessibly priced and tasty, Beronia‘s 2017 Rosé from Rioja and the 2017 Verdejo from Rueda are excellent Monday Wines for vegans and omnivores. The Verdejo is vivacious. You wouldn’t know from drinking it that 2017 was a challenging year for the region with late frost and low precipitation. The Verdejo went into verasion 3 weeks early. As a result, this wine was produced with grapes from two harvests of the same vineyard. The wine is pale yellow-green with citrus, stone fruit, and green notes. Lively acidity and a punch in the finish. We paired it with a vegetable coconut curry, which worked, but I wish I’d saved it for salmon with mango kiwi salsa and asparagus later in the week. The rosé hails from the Rioja region which had similar struggles in 2017. August rains helped the harvest and what they lacked in quantity, they made up for in quality. This is a delightful pour composed of 40% Garnacha, 30% Tempranillo, and 30% Viura. Watermelon pink in the glass, notes of strawberry and peach, balanced acidity and mouthfeel. Refreshing and refined. We paired this with quinoa and garbanzo stuffed peppers with a basil cashew cream sauce. Both wines are around $12 and can be paired with a variety of spring and summer dishes. Both wines had me searching for more on my next trip to the wine store. As appertifs, with seafood, or a variety of vegan dishes, you can’t go wrong with any audience with these Spanish Monday Wines. Great QPR on those wines, and they sound delicious! I really enjoy your posts about accommodating a vegan diet – especially the yummy, wine-friendly dishes you’ve come up with. Cheers to that!